Today is going to be sunny and tomorrow might be rainy, so we're going to be outside all day long. Today I should be posting our Menu of the Week but I really don't want to. I've changed my mind about doing it every Friday. I hope you're not crushed. Today I am back to obsessing about finding a couch. I'm sure it will pass. Today I think you should listen to this interview with Tina Fey because she is rad. I wanted order her book the moment I heard about it, but instead I called the library and am now first on the waiting list when it comes in. Now I can put the money I would have spent in my couch fund. Today my mind is filled with party plans. My friend Jen asked me to plan a baby shower with her and I can already tell it is going to be beautiful. Today I am doing a terrible job at containing my excitement over the season premier of Friday Night Lights tonight. It has been way too long since Tim Riggins has been a part of our week. Today my heart is aching for a new addition to our family. I am growing impatient. Today I am accepting suggestions for things to bake. I have an addiction. Today I am looking for the perfect spot for this print and this print on the walls of our house. I'm also trying to think of a name for our house. In my head I refer to it using the name of the previous owner. Like, "Bob's House," except the previous owner wasn't Bob. Anyway, I think it is time to stop calling it that. Today I am hoping you have a wonderful weekend. I can't wait to see you next week! I was kind of wondered if you were letting 'menu of the week' go by the wayside. Let's get out and enjoy the sun together today, shall we. I too am beside myself with excitement for FNL's tonight. When I saw it on the scheduled DVR recordings, I shouted for joy! I am sorry for the aching heart, you are often in my thoughts and prayers. I will take full (ok, part) credit for the baking addiction! Since you came to me a baking hater and left an addict, I can take some credit, right?! Woohoo — can't wait to see photos from the shower you are planning! You always have such lovely ideas. Love that print. It's not sunny here today.. overcast and windy. Story of out lives. However, I'm still determined to make this day great (I say while eating a chocolate cupcake... right after finishing off my slim fast of course.) Hope you have a wonderful weekend and I hope that aching heart of yours feels better soon! am thinking of you, miranda. we should start a club for that. and for tina fey. i'm doubting my library will get it.. i'll have to inquire. did you see her on oprah? wishing you a wonderful weekend. I am moderately crushed about the lack of Friday menus, but not crushed enough that you should feel pressure to do it. I have the same addiction. At least it's one that others can benefit from, right? I'm sorry about your aching. But oh so happy about your impending visit! 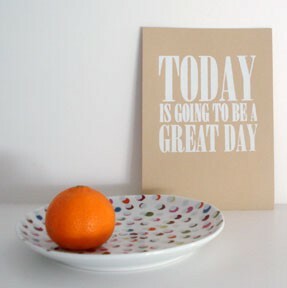 I love this summation of your day. I am happy for the party plans. That is always happiness. But I am sad for your aching. I've watched many friends suffer silently with the same ache, wishing I could be more of a comfort in such a personal struggle. Much of today was spent outside here and I earned another sunburn. When will I remember the sunscreen? I love Tina Fey. She's just the best. And FNL is also the best. Sounds like you are going to have one rockin' weekend! Loved this post, Mandy. I hope your day was great. And I hope that aching heart doesn't linger long. Thinking of you today.